In late November, Normandy Scout hut was transformed into a hive of Christmas activity. 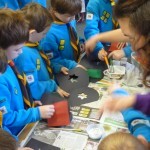 Nearly 60 Beavers from across the district met for an afternoon of festive crafting. The young people thoroughly enjoyed themselves making a wide variety of Christmas crafts. 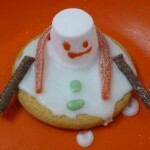 These included felt tree decorations, 3D Christmas trees, snowman biscuits, Christmas cards, toilet roll snowmen and stained glass window pictures. The latter involved much glitter. I expect Normandy will be hoovering it up for many weeks! Thanks to all the leaders and helpers for running the activities, and to all the Beavers who came along. This is sure to become an annual fixture on the district calendar. Our next district event is the inaugural junk modelling competition in March; in which we hope teams of Beavers will again display their creative prowess using a pile of junk! 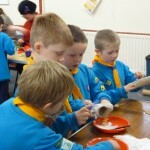 This entry was posted in Beaver Scouts. Bookmark the permalink.